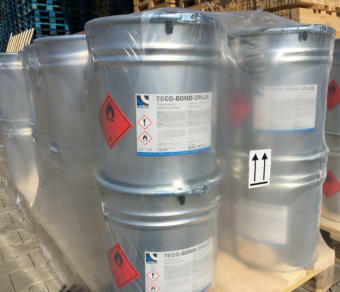 TECO Bonding-System Components: • Spray Gun TECO-SPRAY • Adhesive TECO-BOND-3PLUS • Cleaner TECO-CLEAN • Lubricant TECO-LUBE • Spray Gun TECO-SPRAY Developed for applying the adhesive TECO-BOND- 3PLUS onto the concrete segments for a gasket installation by using the “spray-on method”. 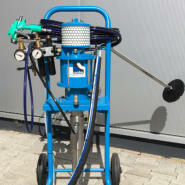 The “spray-on method” always requires the use of pneumatic pressing frames being an additional mandatory component. 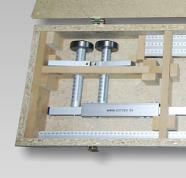 These pneumatic pressing frames are usually tailor-made and supplied by the segment mould supplier. CTS-Application technicians provide start-up and initial operation of the TECO-SPRAY machines on site together with an onsite demo-training for the gasket installation procedure. • Adhesive TECO-BOND-3PLUS Specifically developed for the installation of CTS Elastomer Sealing Gaskets onto concrete tunnel segments. 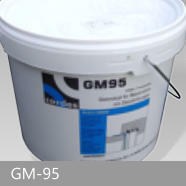 Adhesive TECO-BOND-3PLUS is a styrol- rubber based material that offers excellent initial bonding forces and a high durability. TECO-BOND- 3PLUS can be used for the gasket installation by “brush-on” and by “spray-on” method. The bonding has a good weathering resistance soon after the gaskets have been installed and the segments can be immediately taken out to the open stockyard. The maximal bonding force is reached after 72 hours curing time and mechanical impact on the installed gaskets must be avoided during this time. • Cleaner TECO-CLEAN For thoroughly rinsing and cleaning the TECO-Spray machine and equipment as well as brushes and other tools. • Lubricant TECO-LUBE A lubricant to be used on the contact surfaces of the gasket frames to reduce surface friction occurring during segment installation procedure, especially when inserting the key stone.